New Jersey is the 11th most populous state in the United States and is also the most densely populated. 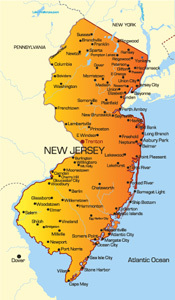 Nicknamed the Garden States, New Jersey is home to just under 9 million people. The capital is Trenton but the largest city is Newark, which is home to 277,000 people. The bordering states are Pennsylvania, New York, and Delaware. The major highways running through the state are The New Jersey Turnpike and the Garden State Turnpike. One notable university within the state is Rutgers University. Major attractions that drive tourism in New Jersey include the Jersey Shore and Atlantic City.